Alternatively you can take a dump of your database using phpMyAdmin, mysqldump, or a similar tool. You should download the .zip file, unzip it on your local machine, and then use a FTP program to upload the files to your server. It doesn't matter where you put this file, we recommend you place it somewhere outside of your web-root. mv zenario zenario_old; mv /path/to/new/files/zenario . mv .htaccess .htaccess.old; mv /path/to/new/files/.htaccess . mv robots.txt robots.txt.old; mv /path/to/new/files/robots.txt . As soon as you switch to the new version, your site will automatically disable itself (it will be down for visitors) if the database schema needs to be changed. If there are only minor changes then your site will remain online, but there may still be some updates to apply. 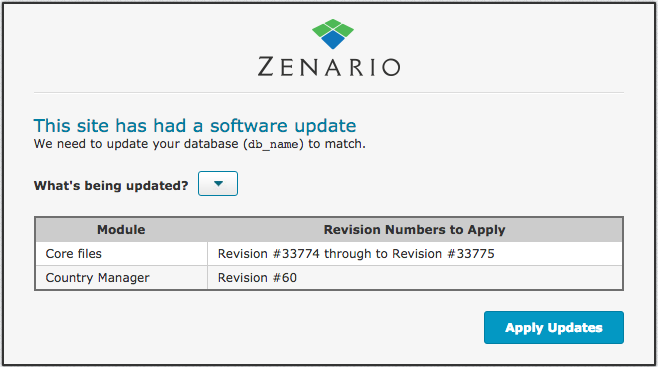 You should click on "Apply Updates" to apply the database changes. When you are happy with the upgrade, you should remove the old files that you moved in step 3.